La roya. It may roll off the tongue, but the ease of this word's pronunciation belies a far more malignant truth no matter how beautiful the Spanish that is spoken here. I have been studying and working in Chiapas, Mexico for almost two months now, soaking in as much as I can of the breathtaking Sierra Madre mountain range during the core of what is both my junior spring of college and my term as a Global Health Equity Option (GHEO) Scholar. It is also here in Chiapas, a region famous for its natural resources, that local campesinos are caught in turmoil over the diminishing returns of their state's many coffee farms. 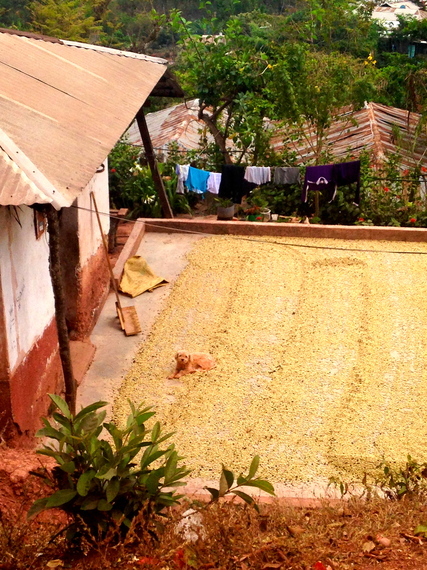 Moises has first-hand experience with the coffee farms of Chiapas. "Fui un tostador," ("I was a coffee toaster") he said as he began his story. Having lived in Chiapas his entire life, Moi had a deep understanding of the coffee that seems to flow more freely than water here, and I was fortunate that he was willing to share his experiences with me. Small-scale farmers and tostadores like Moises primarily produce Arabica coffee, a variety that is particularly well-suited to the high altitudes of the Sierra. But rising global temperatures and fluctuations in rainfall have put productivity levels in peril in recent years. Enter, la roya. This local term for "Coffee Leaf Rust" describes a fungal blight that has wiped out a significant amount of the worldwide coffee crop, adding insult to injury as farmers in Chiapas now doubly face the pressures of decreased output and falling global coffee prices. While companies like Starbucks and Green Mountain Coffee have begun taking action to prepare for the effects of diminishing coffee production worldwide, it is not corporate America that I was thinking about as Moises concluded his explanation. "It affects all the communities deeply," he stated matter-of-factly, glancing towards the shadows now lengthening across the Mexican landscape outside. I thought back to a conversation I had recently had with an American medical resident who had come to offer healthcare services in the rural Sierra Madre. He had just concluded his first week working at the health clinic in the small community of Honduras. During his stay with a host family, he had learned that some of the farmers were trying to enter the aquaculture business by installing tilapia farms in their backyards. However, in my experience, this is not the typical response to the seemingly imminent crisis -- most families have little idea how they will cope when la roya claims the remainder of their coffee crop in one to two years. "¿Quién sabe? No tenemos otro recurso..." ("Who knows? We don't have another resource...") is the most common response I have received when asking my neighbors and friends in the community of Honduras about their plans for the future. As I have come to realize, these doubts and pressures are intrinsic to their daily lived experiences. I may have come to Chiapas with the perspective of a pre-med student interested in health care delivery, but I know too that the economic pressures faced by patients in their daily lives are inextricable from the challenges faced by physicians in the examining room. After all, these pressures often lead to the complications that ultimately force doctors with limited resources to focus on curative rather than preventive medicine. In communities like Honduras, health care remains free, but food certainly is not. As I spend my time studying and working in the communities here, the long-term health implications of falling income levels in regions where poverty is already endemic have been unfolding before my eyes. What medical conditions should medical practitioners anticipate treating in higher frequency in the coming years as the effects of la roya become even more widespread? Will the health care system's response to conditions like malnutrition seem like a proximate solution to the more fundamental problem of parents' inability to put food on the table? The struggle to grapple with the relationship between the fight against poverty and the one for the provision of health care is not new. Where we can intervene through medicine and public health, we have a way of saying, 'We might not be undoing poverty by making sure we have high-quality medical care, but once we get this specific manifestation of poverty out of our body, that will leave you free to fight on against poverty." The core mission of health care practitioners who work in places like the rural Sierra Madre should be, first and foremost, to provide high quality medical care to the poor who live there. While I hope that the government and other public sector agencies will help to provide economic relief in response to la roya by prioritizing initiatives such as the provision of microloans to farmers, this is not a burden that physicians can take on in and of themselves. Instead, as Farmer said, those dedicated to the equitable delivery of health care demonstrate that their work is also an inherent part of the fight against poverty.